Journalist : since you mentioned Iran among the five kings… that’s something I had forgotten. That I had learned, but I had forgotten that Iran was called Persia, and of course that goes without saying. But we forget the time of the name change: 1935. And that you think is important. BHL : It’s an incredible story, and indeed that very few people know, and, in any case, I haven’t read it anywhere, and I tell it in detail. I discovered it somewhere in Kurdistan. On 21 March 1935, Persia decided to change its name to Iran under orders from Germany. Why? Why? Because Iran, in Persian, in Farsi, means “the land of the Aryans”. And, as it was on the rise at the time, Nazi Germany offered the Persians the “deal of the century”. Nazi Germany told the Persians: “We’ll make you the Aryans from the East, we’ll be the Aryans from the West, we’ll have a great adventure together, we’ll dominate the world”. And the Iranians accepted the deal, and we have this incredible “semantic coup”! Because Persia is not nothing. Persia is poetry, it is porcelain, it is extraordinary art, it is so many things, it is an immense civilization, it is Achaemenid civilization, it is a glorious past, and Persia decides that day to draw a line under that past to align itself with Nazi Germany. And what is very interesting is that of course, it didn’t go through with no one batting an eyelid, I tell all that in detail. Journalist : You say that the Allies, in 1941, when they enter Tehran, force the shah to abdicate, do indeed try something and tell the son and successor of the fallen shah that the joke has lasted long enough, and that it is urgent to revoke this evil decree. The Shah does nothing of the sort, and all the allies get is a “neither yes nor no” compromise, which allows one to say Persia or Iran indifferently – except that we continued to say Iran. BHL: in 1958 there is a national debate taking place in Iran with a lot of people saying wait, we’ve been calling oursevles Persia for 2000 years, it’s been only 20 years since we opted for this terrible name [of Iran], we’re going back to the old name! It didn’t work, the leaders chose to keep it. It’s when the Islamic revolution happens that it gets really interesting. Back then, the issue was raised once more. People said, alright, now in 1979 let’s go back to Persia, go back to our greatness as an extraordinary civilization ! And yet for several new reasons, philosophical reasons tied to the presence in the entourage of the ayatollahs of young philosophers, admirers of the Nazi philosopher Heiddeger, who thought it perfect to be both islamist and Aryan, thought it wonderful to forge an islamic Aryanism, or an Aryan islamism. Thus, the islamic revolution created the “Islamic Republic of Iran”. And this story is interesting because it’s quite uncommon for such a thing to occur, because it’s extravagant ; but above all, because it reveals the true undertones that we can feel about Iran, these dark undertones left unsaid, over which islamism, the brown wave, can spread ! The victims of this brown wave are Iranian women, forced to wear the veil, Iranian homosexuals who are jailed, adulterous women who are stoned or threatened to be stoned, like Sakineh Mohammadi Ashtiani and so many others. And it also says a lot about radical islamism and what we call jihadism. Because this is Shia islam, but such things are equally found in Sunni islam. This jihadism is rooted in two different origins. Of course, these people, jihadists, radical islamists, are Muslims. The fact that they claim to speak in the name of the Qu’ran is a very serious thing to consider. But they are also among the people who never stepped away from the dark, tragic, atrocious past of the twentieth century ; the last people who still haven’t gone through denazification. But the only place where denazification never took place is the Shia world, Persia, and the Sunni world, the Muslim brotherhood – Tariq Ramadan’s grandfather was a Nazi. What were the Iranians thinking when they renamed ancient Persia in 1935 to give it a Nazi name ? It is little known and it is the extraordinary episode of the change of name, in 1935, of the Persian empire. Reza Shah, founder of the Pahlavi dynasty, happens to be a friend of Germany whose Anschluss, Sudeten coup and anti-British crusade he will support. He believes, like the future Arab Baathists, like the Grand Mufti of Jerusalem, that a new German empire is being born which will be neither holy, nor Roman, nor only Germanic, but Aryan. Furthermore, he knows that this Aryan myth is, at the same time, in Germany, at the centre of an intense intellectual turmoil that is enfevering universities, revitalizing archaeology schools, dividing the academies of comparative linguistics and philology. He knows that, in these discussions, the idea is being imposed that the “cradle” of this “Aryan” language, civilization and race would lie somewhere between the Euphrates and the Himalayas, that is to say, according to some, lo and behold, at the heart of modern Persia. Of course, the descendants of the Achaemenids have always also been called, in Farsi, “Iranians”, that is, “Aryans”. Of course, the word “Ariaoi” appears, as of Herodotus, to designate the heart of this empire which extends between the Danube and the Nile. And he himself, Reza Shah, ten years earlier, at his coronation ceremony, had insisted that a herald announce, in the purest Persian tradition: “Finally a man belonging to the Aryan race has arrived at the head of our State”. But one must put oneself in the shoes of a diplomat stationed in Tehran, or those of the head of a great chancellery, receiving, on this day of March 1935, the news that it is now forbidden to say “Persia” and that only “Iran” will, from now on, be admissible. In France, one must read the far-right press of the time and, for example, in the July 6 edition of Je suis partout, the enthusiastic, thundering, triumphant report by Belgian fascist Pierre Daye, entitled “Persia Becomes Iran” and devoted, for the most part, to this name change. It needs to be stated that this brilliant idea had come from the Iranian legation in Berlin, which had itself gotten it from the German authorities – any lingering doubts about this fact would have been quashed when Radio Zeesen, the Persian branch of the Nazi radio, the propaganda medium that keeps preaching, in Tehran, the alliance between “the northern Aryans” and “the nation of Zoroaster”, didn’t miss an opportunity to mention it. There is no doubt for anyone on that day that the decision is, for all parties involved, part of a large-scale rapprochement; that it is a question of being as many as possible to shout, in unison, “Aryans of all countries unite” and that it is an opportunity for the Persian-Iranians to live up to the destiny offered to them by Hitlerism and which allows them to align themselves with what then seems to be the winning combination of History. The Nazis and their ideology, which was expected to reign for a thousand years, were thrown into the dustbin of history. Everyone expects the “Iranians”, like so many others, to say: “Persia will always be Persia – what weighs, in the face of two thousand five hundred years of glory and unspotted splendor, those poor ten years when, under the harmful influence of a handful of unworthy sons, the descendants of Darius and Xerxes misguidedly aligned themselves on the black star of Europe? Let us go back to better times ; let us rehabilitate our beautiful name “Persia”. Strangely enough, this wasn’t what was said. More specifically, this wasn’t what was done. The Allies, in 1941, when they enter Tehran and force the Shah to abdicate, try something and tell the son and successor of the fallen ruler that the joke has lasted long enough and that it is urgent to revoke the evil decree..: the Shah does nothing about it and all they get is a “neither yes, nor no” compromise that allows one to say, indifferently, “Persia” and “Iran”. The Prime Minister of the new Shah, Mohammad Ali Foroughi, who also happens to be a great scholar, author of several fine commentaries on the works of Hafez, Rûmî or Saadi, and furthermore, Persian translations of Descartes, added with indignation that a legendary country had been transformed “with the stroke of a pen” into some kind of new country, with an unknown name, which the rest of the world would confuse with Iraq: he is not listened to any more and dies, the following year, sorrowful over what he perceives to be the suicide of a great nation. As the problem became more serious and more and more voices were raised, in the world and in Iran itself, to say that it was about time, indeed, to return to the situation which prevailed before this fateful semantic coup d’état, a commission of scholars, writers, moral consciences, constitutionalists and politicians was convened in 1959. This commission also recommends to close the parenthesis and to return, once and for all, to that noble name of Persia which, in the spirit of the world, is associated with poetry, miniatures and porcelains, to the great texts, even to the cats or to the Persian rugs – an entire, humble and prestigious heritage which we took the risk of cutting ourselves off of by defining ourselves, urbi et orbi, only as the “country of the Aryans”. But the power still resists. Here too, only a compromise over the “optional” use of either of the two names could be reached. And when, in 1979, finally, the Shiite islamists overthrow the regime, there are still Iranians who remember the mad mutilation inflicted, forty-four years earlier, on their country..; there are still voices who, when told that Iran must be called “Iran” because it was also the ancient Persian name of Persia, reply that it is as if Greece suddenly dared to call itself “Hellas”, Egypt to impose its Arabic name of “Misr” or China the Mandarin name of “Zhongguo”; there remain scholars to object that to this account we should also call “Iranians” a whole host of territories that historically covered Kurdistan, Baluchistan, Ossetia, Tajikistan, Afghanistan, Sogdiana, and so on; but these are considerations which, because they can only revive the ashes of a pre-Islamic past, are of little interest to the ayatollahs on their way to power; they too seem perfectly at ease with their “country name” inherited from National Socialism; and that is how the matter is put to rest ; Iran remains called, to this day, the “Islamic Republic of Iran”. Nominalist denazification did not take place. The name “land of the Aryans”, with all that it necessarily implies, in the forgotten collective memory, about the 1935 coup de force, erased the use of the name Persia. Wich means that if we believe, even a little, in the unconscious of languages and the power of their names, we must conclude that a spectre haunts Iran and that it is still that of what the European twentieth century has produced most disastrously. Moreover, is it so certain that this case seemed of no interest to the ayatollahs? And did they not know very well what they were doing by persisting, as the old regime did, to favor a name inspired by the Nazis during the still recent nominalist putsch of 1935, to the one left to them by their national tradition? What if this Nazi genealogy the skeleton in Iran’s closet ? 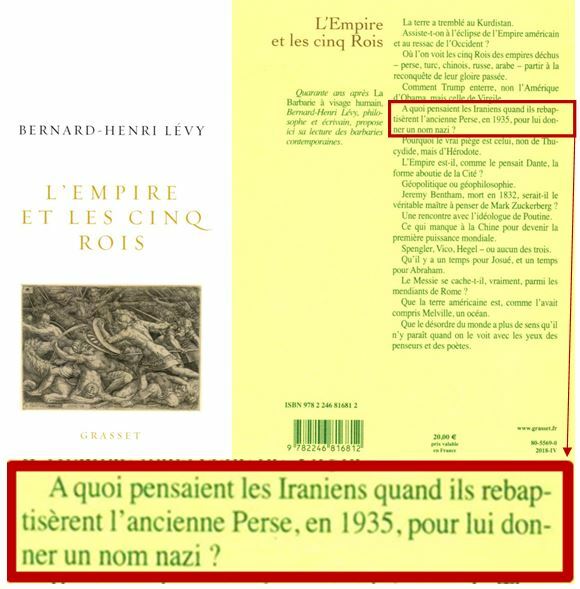 So it seems the “researchers” you consulted “shared their surprise, even their sneering, when they discovered the story” I told Laurent Ruquier, which is also quoted in my book L’empire et les cinq Rois, about the name of Persia changing, in March 1935, to Iran ? I do not wish to argue here. But to your readers whom this sniggering might have shaken, I’d recommend, among many others, the following historians. Charles Bloch, who, in Le Troisième Reich et le monde, Imprimerie nationale, 1986, pp. 255-256, writes : “Shah Riza Khan and his collaborators remembered that Persians were Aryans and thus changed the official denomination of their country to Iran, as suggested by the legation in Berlin”. Barry Rubin and Wolfgang G. Schwanitz, Nazis, Islamists and the making of the modern Middle East, Yale University Press, 2014, p. 114 : «The German-Persian relations were so successful that the shah’s decision, in 1935, to change the country’s name from Persia to Iran (derived from the word Aryan) is often attributed to a suggestion from Iran’s ambassador to Berlin». Kenneth M. Pollack, The Persian Puzzle, Random House, 2004 : when the Shah took his decision and signed the royal decree initiating this semantic coup d’état, “he clearly was affected by Hitler’s methods”. Or the testimony of Ehsan Yarshater, professor of Iranian studies at Columbia University and designer and director of the monumental Encyclopedia Iranica, which allocates an entire article to this issue of denomination. Or the testimony of Wipert von Blucher, representing Germany in Persia at the time, who, at page 324 of his book Zeitenwende in Iran. Erlebnisse und Beobachtungen, reaches the same conclusion. Or finally the last Shah’s memoir, son of the one who signed the decree. What does he have to say, in 1979, at the end of his life, about the motivations of his late father ? He says (at pages 61 and 62 in the French edition of the book) that he “deliberately encouraged Persian-German relations” ; and he adds (and I quote) that national-socialists encouraged this by heavily insisting on the “common origins of our two peoples”. The press of that time wasn’t fooled either. As shown in the article of “Je suis Partout”, which I quote in my book and whose facsimile I hold at your disposal. As shown in the New York Times, who, as early as January 1st 1935, three months before the decree, reports on this pact between Aryans ; and who, on June 26th 1935, in another article entitled “New names of places : change of Santo Domingo to Trujillo recalls others” writes that it is indeed “a suggestion from the Persian legation in Berlin” which convinced “the government of Tehran, during the Persian New Year, to substitute Iran for Persia as the official name of the country” and adds that “in this decision, the influence of the Nazi’s increasing interest in Aryan races, anchored in ancient Persia, is visible”. Please do provide these clarifications to your readers. Because after all, this doesn’t appear to be a laughing matter. Est-ce que BHL sait que les “aryens” ce n’est pas un mythe NatSoc (et non pas nazi. Dire nazi pour NatSoc c’est comme dire gaucho pour socialiste. Si on veut faire de la sémantique…) mais effectivement le nom que les textes anciens (perses, grecs, hindous… niveau sources dure c’est pas vraiment le choix qui manque) accordent à l’antique peuple que certain pense être le peuple originel “proto-indo-européen” avant sa dispersion, qui n’a rien à voir avec les aryens (une des première grosse hérésie chrétienne) mais viendrait du sanskrit “Āryā”, “noble” et se retrouve dans a peu près tous les ancien langages indo-européens pour signifier tour à tour noble/citoyen/vénérable… “Iron” voulant dire “pays des aryens” en perse depuis, ben depuis qui a du perse. Et désignant bien en Perse peu ou prou la zone géographique de l’Iran actuel (et non la Perse, la Perse c’est vachement plus grand hein, minimum ça commence à l’Euphrate et ça finit sur les rives l’Indus. Du coup si ils avaient voulut un nom qui en pète pour conquérir le monde, il suffisait de pas en changer). C’est pas les illuminés du 3ème Reich qui l’ont inventé. Eux ce qu’ils ont inventé c’est que les peuples aryens étaient supérieurs à tout les autres. Après certes l’idée de changer de nom est venu des allemands de l’époque et que le diplomates et le Shah on juste décidé que “pourquoi pas”, tu réformes le pays tout en lui donnant une grandeur mythique passée mais en abandonnant de facto les récriminations de voisinage bien réelles de l’empire Perse et tu fais plaisir aux allemands qui t’aident à moderniser le pays, c’est clairement pas cher payé et donc en son temps une excellente décision. La vrai question c’est est-ce que BHL est prêt à dire non à son portable, son micro-onde, son GPS, son hélicoptère, son jet et ses chemises à grand cols style Hugo Boss? Non parce que si on doit rétroactivement enlever tous les trucs qui ont des racines dans le 3ème Reich, il va littéralement finir à poil quand même. Juste pour dire que l’hérésie chrétienne est l’arianisme, et ses adeptes les Ariens. Je ne sais pas ce que fume notre cher pipeausophe national mais ça a l’air vachement puissant. Je pense qu’il doit s’approvisionner chez les dealers de Neuilly qui approvisionnent les quartiers des ultra-libéraux de EM, le discours est assez similaire quant à niveau de délire. Un délire totalement déconnecté de la réalité. Il lui faudrait une cure de désintoxication (à vie, visiblement l’addiction à ce produit ne finit qu’à la mort du junky), ce qui nous ferait des vacances. Question N° 1 : Laurent Ruquier, déroulant le tapis rouge à l’imposteur en chef, est-il lui-même un imposteur ou simplement un idiot utile ? Question N° 2 : Lequel des deux est le plus dangereux ? Question n° 3 : combien de tartes à la crème Ruquier a-t-il reçues ? (Bernard-Henri Botul en a reçu huit, entre 1985 et 2015). Euh, c’est la même chose que la version française ?